Support Centerville-Washington History by becoming a member. You will become a part of an active and interested group of citizens that not only help to preserve our community's history, but continue to learn new things about the community and about history in general. 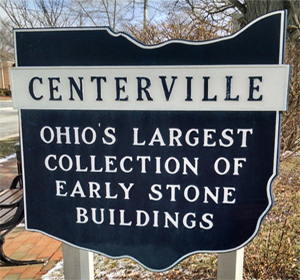 Centerville-Washington History maintains and operates three different museums and a Resource Center in the Centerville community. To learn more details about the buildings and what each location features, please visit our Museums page. Explore our history and learn about our historic Stone Buildings of the area. There are also many important People, Places, Artifcats, and Historical Events of interest that played important roles in shaping our area that have been cataloged and documented by our members. The historical society has many different books and publications available for purchase online or in the Walton House Museum. Centerville-Washington History was founded in 1966 as the Centerville Historical Society. To learn more about our organization or to become a member, please choose from the options below.